North Penn and Temple grad Brandon McManus celebrates the game-winning field goal that sparked controversy in the sportsbetting world. Took them a couple of days, but FanDuel decided to pay off that disputed Broncos bet after all. 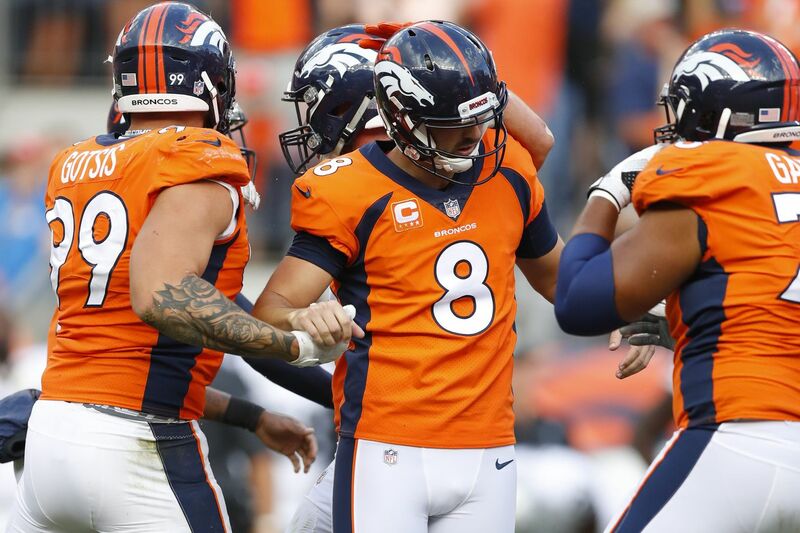 The trouble started during Sunday's Raiders-Broncos game, when, with the Broncos trailing by two and driving with about 70 seconds left, FanDuel posted money-line odds on the Broncos to win at 750-1. The line was up for 18 seconds, and at least three bettors pounced. Until it came time to cash in. Anthony Price, of Newark, told News12 New Jersey that FanDuel declined to honor his ticket because a computer glitch had created erroneous odds. They should have been 1-6 instead — wager $600 to win $100. Price thought he had won $82,610. Instead, he won around $18. On Thursday afternoon, FanDuel had a change of heart and said, "This one's on the house." "Above all else, sports betting is supposed to be fun," the company said in a statement. "As a result of a pricing error this weekend, it wasn't [fun] for some of our customers." FanDuel, which runs the sportsbook at the Meadowlands race track, had reported the incident to the New Jersey Division of Gaming Enforcement which was pleased that the company settled the matter. "The Division is encouraged by FanDuel's actions today," the DOGE said in a statement. "The Division will continue to work with FanDuel and the State's other licensed sports-wagering operators to ensure the implementation of industry-wide best practices. " There is fine print within FanDuel's terms that allows the sportsbook to void odds that resulted in computer error. This policy was condemned heavily in the wake of the company's decision not to pay Prince and at least two other New Jersey men. Brandon McManus, the Broncos kicker from Temple and North Penn High, who won the game with a field goal, spoke for the masses when he tweeted on Wednesday that FanDuel ought to "Pay the People!!!" The Broncos were +$340 before they completed a 26-yard pass to set up the game-winning kick. After the pass, they should have been -$600, FanDuel said, but somehow +$75,000 appeared. That's when Prince and others pounced. Jay Kornegay, who runs the Westgate SuperBook in Las Vegas, tweeted that his company had to eat some bets in 2011 when it opened LSU as a pick 'em against Northwestern State, an FCS school in Natchitoches, La. LSU won, 49-3. The line should have been LSU minus 54, Kornegay said. Yikes. He said bettors intentionally kept wagers low so they wouldn't set off alarms. "In gaming, it can't be a subjective decision," Kornegay wrote. "The Vegas rule, 'Tickets go as written,' is a staple. We've paid out mistakes, and guests have received the 'wrong' tickets. Once they leave the window [or confirmed on mobile], it's action." Kornegay would start with the infrastructure. "We've had other mistakes that have taken place against us," he told us. "It goes both ways, but [the] software shouldn't allow those tickets to be printed without approval." FanDuel also announced Thursday that it is running a contest this weekend by giving $1,000 to 82 randomly selected customers who have established an account by 10 a.m. ET Sunday. "We are committed to ensuring sports betting is reliable and fun for everyone, and we don't want an 18-second error to define anyone's experience," FanDuel stated. "So let's have fun." That, kids, is what is known as spin control. Good to see them do the right thing. *Penn State is a 28-point road favorite Friday night at Illinois. The Lions were 2-2 last season against the spread as road favorites in Big Ten play. This is the largest they've been favored in a road conference game since they laid 27 at Rutgers and won, 39-0, in 2016. Penn State has easily covered its last two games since nearly getting upset by Appalachian State in the opener. *The Eagles were 10-3 against the spread in games started by Carson Wentz last season, including 5-1 at Lincoln Financial Field. *Good luck figuring out Temple, which lost outright at home to Villanova in Week 1 as 15-point favorites and went to Maryland last week and won outright as 15-point underdogs. The Owls were favored by a touchdown for Thursday night's home game against visiting Tulsa. The Owls were 12-2 against the spread in 2017. Handicapper Vegas Vic's pick for Thursday night. Don't have much interest in the Jets-Browns, so let's look at the college game. Double V is wondering which Temple team do we get tonight. The Owls who looked ugly in the first two home losses to Nova (19-17) and Buffalo (36-29)? Or, the high flyers who went down to College Park and stunned Maryland as a +15.5-point dog with a loud 35-14 W? Man, why do they wanna make my job so tough? But, I'm banking on last week's version. Expecting QB Anthony Russo to manage the game, while RB Ryquell Armstrong gobbles up another 100+ yards. And the wicked defense that held the Terps to only 63 yards through the air and 132 on the ground should be ready to turn the Golden Hurricane into a mild summer sunshower. Gimme $55 to win $50 on the Owls.